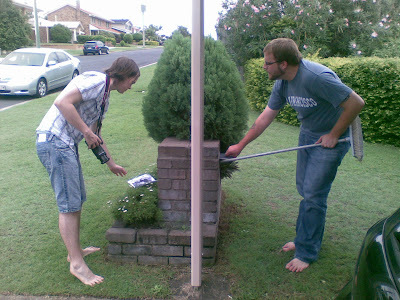 A couple of weeks back I helped out Henry and Greg from Skills In Time for a sketch about peaches. It was a pretty mad fun day. Here is the mad fun video that became of it. Watch, won't you? I've been seeing a helluva lot more acts at the Brisbane Comedy Festival than I had previously anticipated. If you count Adam Hills and Hannah Gadsby who I saw at Chalkboard but didn't see their shows, I'll have seen 9 acts. If you don't count them, that's 7 which is still more than expected. I should really do a review of the ones I've seen - all but one are going onto Melbourne, some to Sydney. 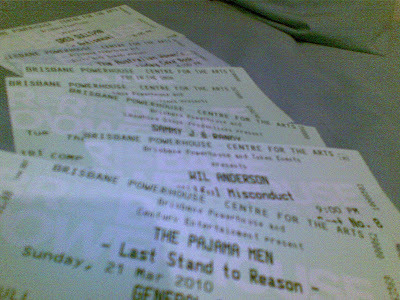 I've been collecting my tickets in case I need a photo of the tickets to start a blog entry. Also, I've collected a drop of blood from each of those acts, put them on the back of the ticket then filed it ala Dexter and his slides.